You are here: Home > News > Brand new website! Welcome to the brand-new Harry Menkehorst website. Our website not only received a total makeover, we also made it more user-friendly for you, our customer, to search, find, request and order plants. You can browse our products per category or select the first letter of the desired plant within a category, and you can now also use our smart search function, which is similar to the Google search engine. 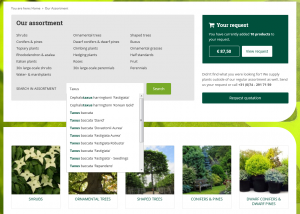 Simply start typing (part of) a Latin plant name and our search engine will immediately display several suggestions in alphabetical order. An example: let’s search for ‘Taxus’. 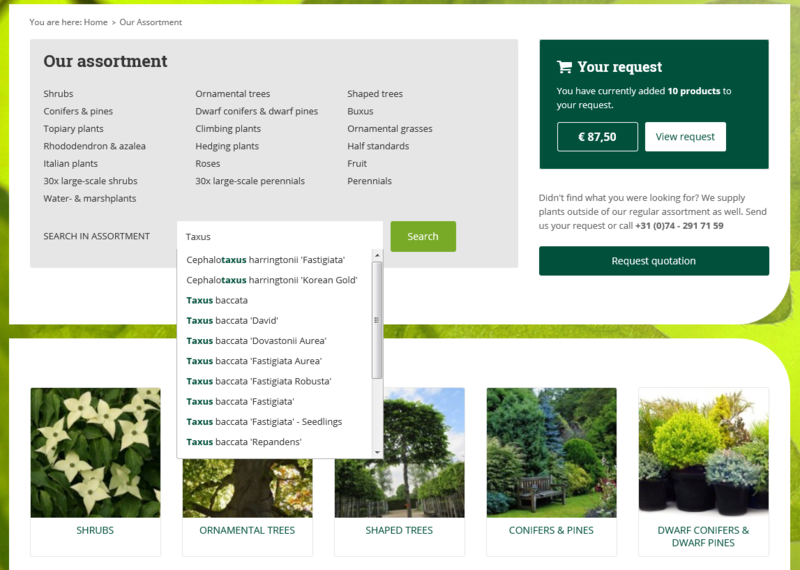 You can select the Taxus you were looking for in the suggestions list directly. Would you like a complete overview of all Taxus in our range, including sizes and prices? 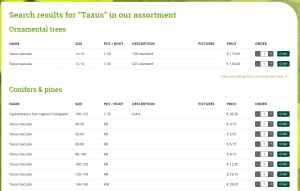 Then press enter (or click ‘Search’) to display the overview of all our Taxus (click on the image to zoom in). 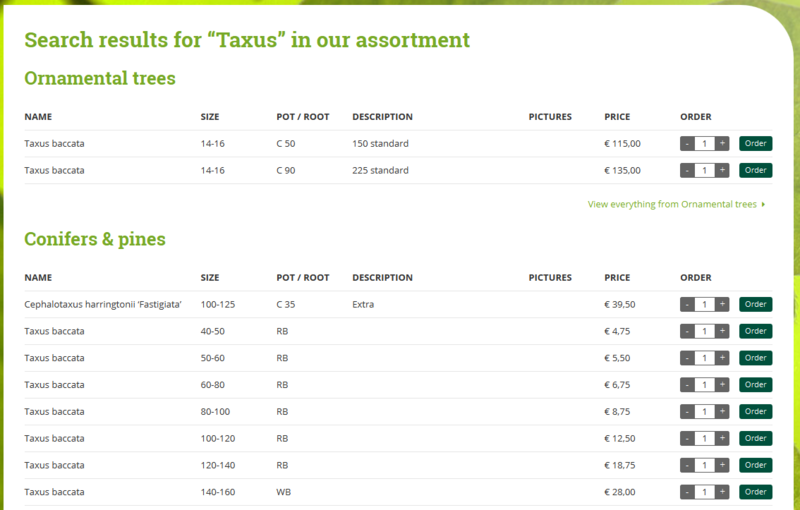 As you can see, the search engine displays all Taxus plants in our assortment, sorted by category. Since we only deliver products to registered customers, you need to log in before putting products on your request or ordering them. You can order directly from the overview. 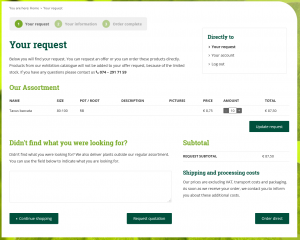 Simply insert the number of items you need on the correct line and click on ‘Order’. The article will be added to your request, which you can find twice at the top of the page, as shown below (click on the images to zoom in). Click on ‘View request’ to display more details. 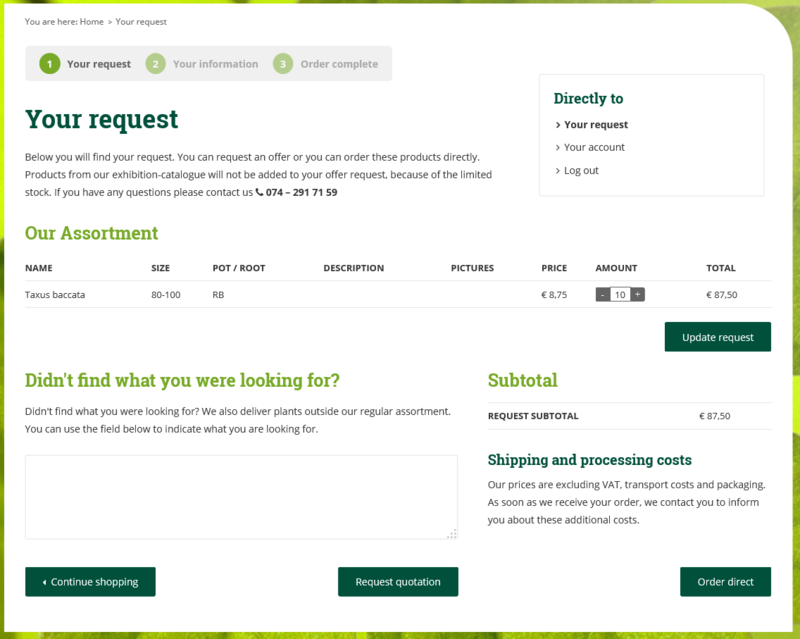 In this overview of your request you can check your request once again, change the number of items you would like and add any additional items you are looking for. You can then choose to continue shopping, request a quote or order the selected products straight away by clicking on ‘Order now’. You will then be redirected to the second step of your order, where you can choose a date to pick up your items yourself or have them delivered. Once you are sure you have entered the correct details click on ‘Place order’. You will receive an order confirmation as soon as possible. Do you need any help using our website? Don’t hesitate to phone us on +31 (0)74 – 2917159.